Figures suggest that on any given weekday around 500 face-to-face charity fundraisers can be found on UK high streets. 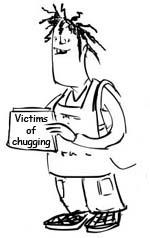 Affectionately known as chuggers, a word derived from combining ‘charity’ with ‘mugger’, my local high street seems have more than its fair share of the pesky buggers. I have no issue with the chuggers themselves of course – they’re only trying to earn an honest crust after all. What bothers me more is the charities who employ them. Research indicates that two-thirds of the Great British public would cross the road to avoid a chugger and that 25 per cent of people actually hate being approached by one. Assuming that there is some substance to this research, the stark reality is that deploying chuggers cannot be good for a charity’s reputation. Can you imagine any kind of successful commercial entity operating in a way that knowingly alienates more potential customers than it pleases? Well yes, this does sound a touch dismissive and pretty complacent actually. Perhaps they should take heed and do something about it rather than pretend it is not a real problem which is affecting the reputations of their members on a daily basis. The return on investment for charities that chug is around 3 to 1, which I guess to them must seem pretty attractive. But do supporters really want to see a third of their donations lining the pockets of the chuggers rather than go directly to the charity? I know I don’t and personally I think it lacks imagination and is lazy fundraising. I have a soft spot for charities who choose to communicate and engage with potential supporters directly and in a way that creates a positive and sustainable relationship, especially those who use volunteers and ambassadors to spread the word. I know it isn’t easy, but I’d like to see a lot more hugging and a lot less chugging.